A video has emerged of a pregnant woman being thrown to the ground and arrested in Barstow, California, for refusing to show her identification. The police officers at the center of the storm have defended their actions and the use of force. The footage, obtained by the American Civil Liberties Union Foundation, showed the incident that took place in January, when Charlena Michelle Cooks was eight months pregnant. The black woman had been driving to drop her daughter, who is in the second grade, off at the Crestline Elementary School in Barstow. While she was entering the school grounds, Cooks was involved in a minor traffic altercation with an unnamed white woman, who told a police officer who had arrived on the scene that Cooks was acting “all crazy.” The woman was an employee of the school. The officer added that “I don’t see a crime that has been committed” and went over to speak to Cooks. "I don't even think that that disagreement in the parking lot was enough to warrant a call to the police," Cooks later told the Desert Dispatch newspaper. After a brief and calm discussion between the police officer and Cooks, the law enforcement official asked the pregnant woman for her name. However, Cooks insisted she did not have to provide him with this piece of information. “I actually do have the right to ask you for your name,” the officer replied. “Let me make sure,” Cooks said as she took out her phone to call someone. The police officer seemed happy at first for Cooks to make the call, saying she had two minutes. However, the video shows that after around 20 seconds, the officer began to become agitated and asked the woman to provide her name. The situation quickly escalated as the officer and a colleague tried to handcuff Cooks and eventually took her down onto the floor, chest first, despite the fact that she was eight months pregnant. "I don't think I've ever been that terrified in my life," Cooks told the Desert Dispatch. "I never saw that coming. I told him I was pregnant so he could proceed with caution. That didn't happen and the first thing I thought was I didn't want to fall to the ground. I felt the pressure on my stomach from falling and I was calling for help. But those guys are supposed to help me. But who is supposed to help me when they are attacking me?" Despite their heavy-handed tactics, the Barstow Police Department backed the officers at the scene, saying they did nothing wrong, despite the fact that the charges against Cooks were eventually dropped. "The Barstow Police Department continues to be proactive in training its officers to assess and handle interactions with emotionally charged individuals while conducting an investigation, for the protection of everyone involved," a statement read. The police department also denied the incident was racially motivated. “Barstow is a racially diverse community, as is our Police Department, and we affirm our Police Department’s commitment to protect and serve all of our residents,” the statement added. 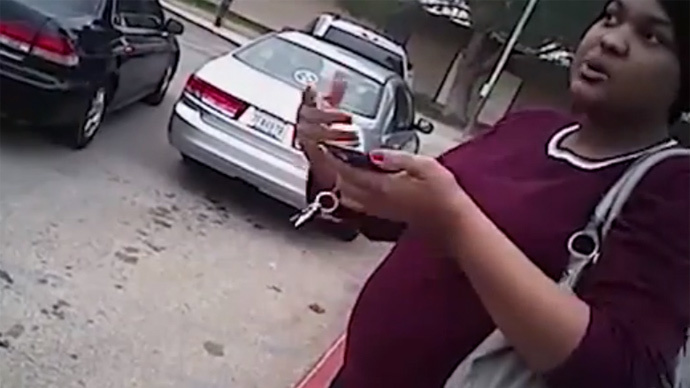 A staff attorney from the American Civil Liberties Union Foundation for South California, Adrienna Wong mentioned that Cooks had every right not to tell the police officer in question her name or show him her identification. “Officers in California should not be using the obstruction law, Penal Code 148, to arrest someone for failing to provide ID, when they can’t find any other reason to arrest them,” Wong added. Cooks was banned from going near her daughter’s school until the charges were dropped. She is now contemplating whether to sue the police department. Thankfully for Cooks, she was able to give birth to a daughter on March 30 and hopes that the incident will not have any long lasting effects on the infant.